Im glad to see so much involvement though. past few years, and she really has it dialed down at this point. glad to see everyone appreciate it...thanks so much! So......another way to cleanse the skin? CLEAN WATER. circles have heard the buzz about freshly harvested spring water. and his work has really sped up my personal progress. REALLY resonate with me to the core. Im turning into a DV junkie for sure! and click on the Health and Nutrition podcast section. content, but the free membership that I have is still amazing). Ive got some podcast from O.R.N. going. so if you havent heard that one, for sure...check it out. more adaptable for them than showing them David Wolfe's. The more you listen to the interviews, the more you'll know what I mean. Anyways, back to the water. 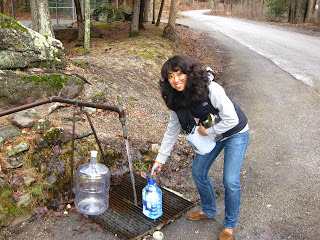 own spring water is SO win-win all the way. bottles for months and months, and is FREE. Here is a video that we made from that day. We harvested 18 gallons and still have about 6 left. Its been 9 days, but there are two of us. one month of water each time they went. from where you live too. Don't assume immeadiately that you can't. never ever want to go back to the old ways. 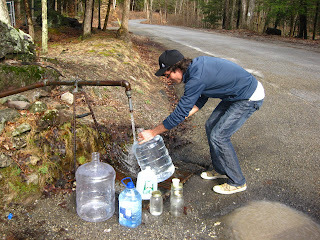 and "natural springs" or "spring water".